Dude, if I get this in today, it counts for March! We are doing pretty well. My main challenge is just that I am ridiculously overworked with too many projects and I cannot let any of them go. We are digging ourselves slowly but surely out of the last few months challenges. We were organizing school stuff. This is pretty much this years’ curriculum. Math…They finished the 1B book in Math in Focus. We are in Chapter 3 of the 2A book which is subtraction of 3 digit numbers with regrouping. We are chugging along. Reading…Naim is on the last lesson of Ch.1 in Reading Horizons. We need to wrap up the test stuff before we go on to the next book. He is doing fairly well with his “Most Common Words.” He can read a lot of stuff and I notice him reading other stuff out in the world on the fly. We are sloooowly coming along. 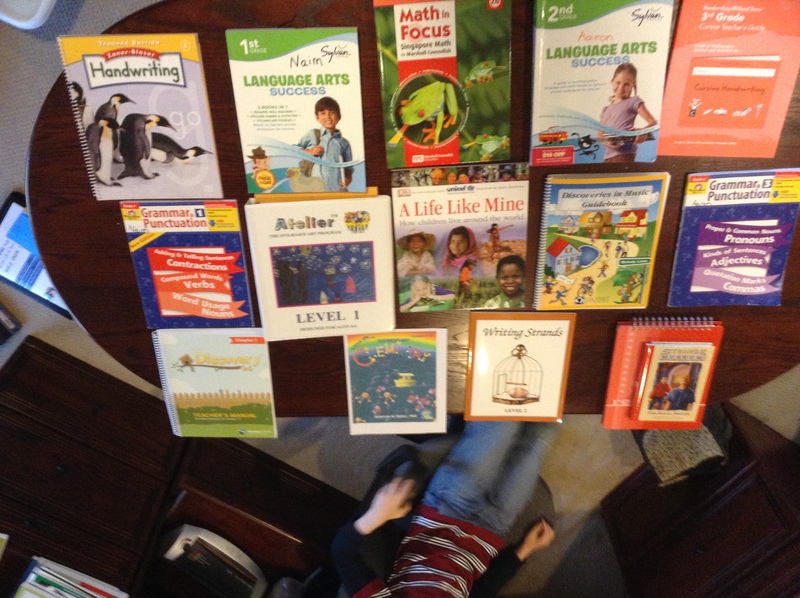 Reading for Aaron…he finished all of Master Reader and thus the whole 5 year Hooked on Phonics Curriculum. I tried to have him read on his own, but he doesn’t really do it well. So now I bought him a curriculum from the Teacher’s Mailbox which is just 36 cards with some non-fiction reading, questions, and then a writing assignment. And then somedays he will read a National Geographic or something. We have started to read “Little House in the Big Woods.” After finishing Mr. Popper’s Penguins and Ramona, Age 8. There are two more Ramona books but I think they needed a break. So far, the LH book is doing OK for them. They are both moving along in Sylvan and Sylvan Spelling. Aaron is midway through the first Cursive HWT book. He is doing ok with it. Naim and I have just bought some practice handwriting books from Learning Palace and are just working through them. I do think his handwriting has improved in legibility, although it still has a way to go. We have done two Atelier Art projects. One was on Van Gogh, the other was a chalk and glue mixed media tactile thing. We are on Lesson 13 in Music. We have started Real Science for Kids Chemistry (the primary book.) There are ten lessons. We read a chapter from the book, do an experiment and write up a lab report, do a sort of lap book study guide and then take a test. We have just finished the first lesson on the basics of atoms. We have started reading the UNICEF book “A Life Like Mine.” It is based on the UNICEF charter of rights for children. It talks about the right, then shows how different children around the world live in regards to that right. So far we have read the first unit on Survival, which had chapters on water, food, shelter and health. We have done a bit of Angel Bear Yoga. Oh, we did a Little Passport or two. I think I only have one left. They want to do the states one, but I don’t think I can afford it right now. This isn’t really curriculum per se, but we continue to work on what I will call ADLs (holdover from special ed) Activities of Daily Living, AKA chores! We are working on having upstairs and downstairs partners to get work done. It goes incrementally slow and tedious. But that is pretty much how housework goes. Aaron finished HOP Master Reader! The poster behind him shows his progress. Aaron did a good job in Art at PCAS. I heard no major grumbles from the teacher. Naim actually tried a trial day and liked it, so we are thinking of switching them next term. Naim was the Emperial General in the Emporer’s New Clothes at NWCT. He did ok in the play. But I am kind of thinking that he needs to take learning lines more seriously if he wants to continue in theater. I really wish I could find him a good improv class, because I think he would enjoy it. At Village, Aaron had Explorers, American History, Pirates, and Legos. Explorers was fine. AM we had trouble getting him to read the assignments. Pirates seemed ok except I am suspicious over what happened when they had a treasure hunt and Aaron “won” a giHUGic lego pirate ship. This mystery has never quite been resolved. Legos was OK but he had some incidences getting picked up because he often lost something he brought and put everyone through hell until he found it. Because of this and some other meltdown problems, I am pulling him out of VH for a term. Naim had Explorers, Schoolhouse mash-up, World History, and Fun Sports. He did well in all of them. They took 2 days of Spring Break Zoo Camp while I dealt with a medical issue. One day was Zoo Clues and the other was Animals of the Northwest. There was another meltdown on one day concerning aftercare and pickup with Aaron. So…. Avery has continued to attend Goddard two days a week and is doing well. Let’s See…Naim and I went to OMSI and saw the Tony Hawk exhibit, the usual OMSI stuff and toured the submarine. We went to VH’s Bloom fund raiser and talent show. Kids and I went to see the Lego Movie. Naim went to a youth symphony with his friend R. They also made several trips in the snow to sled. We’ve done some of the usual 53rd Street Park and Outdoors In, also Bagley Park. We also went and checked out the new library. 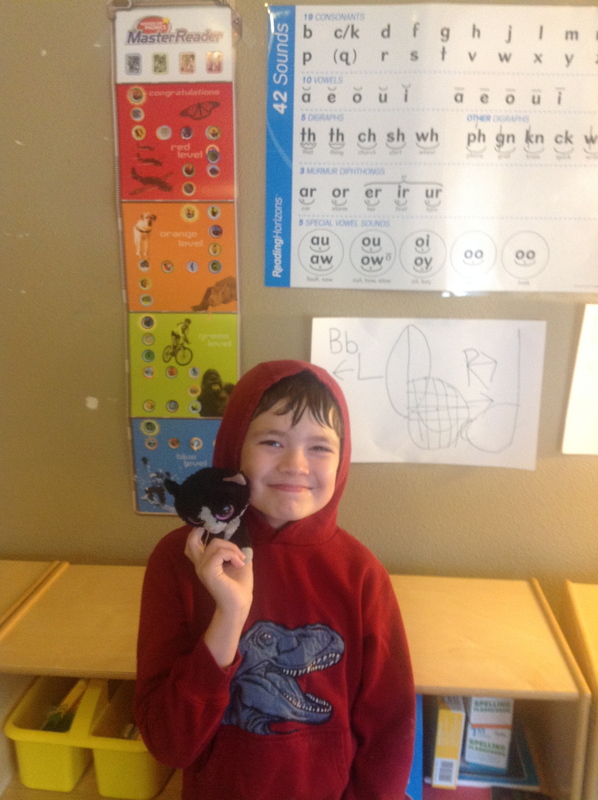 Avery went to a birthday party for one of his Goddard classmates at Oregon Gymnastics Academy. He did really well after the first few minutes. It really helped that his former teacher, Tracie was there because her son is also in his class. As I mentioned, A has been having meltdown problems again, after I thought it was getting better. The final straw was taking him to get his haircut. He just had a screaming fit. When we talked later about it and about how he had other options (one being sitting and enduring a few minutes of discomfort respectfully) he said that he did not know that was an option. (!?!?!) So I have been reading up on self-regulation and executive functioning skills and trying to come up with some strategies. But for now, (and because there are consequences for his actions) he has been pulled out of every class except drama (which he is at right now!) My thought process is that maybe he might learn some self regulation in drama (it is just intro to acting, all games and no play). And he needs something to work with so he can earn back the privilege of more classes. Naim got braces! Finally! It is the first step and he has them on the bottom only until May when they will finish the top ones. He has done really well and is very compliant. This is another reason we thought he might like to chill out in art and not have to worry about a play. Talking hurts right now, he says. Aaaand…Naim learned to ride his bike in like, one afternoon. We are getting there, we are making it…slowly!